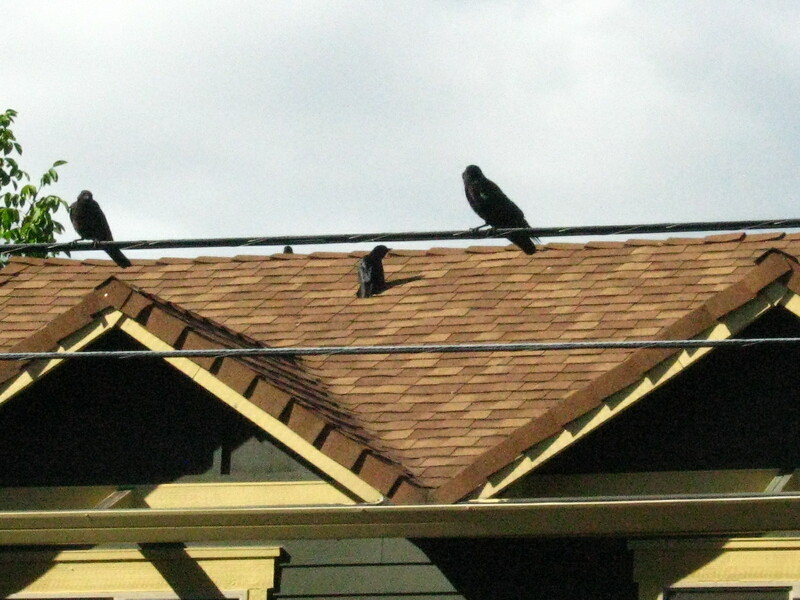 Lyanda Lynn Haupt says that a crow couple needs about two city lots as breeding territory. our crows have a lovely mess of a nest in the maple tree behind our old house. we’ve watched these crows gather nesting materials and raising their babies for three years now. at our new place, the living room window opens to a wonderous view of the great old trees. even though we moved, we got to keep our crows. this year there were THREE babies. i don’t know if they adopted a baby or if they fledged three eggs. i don’t even know if it’s that uncommon. but i’ve never seen three babies looking for food from one mama. amazing. do click trough to see last year’s crows. and this sweet video from two years ago showing just how loud our neighbors can be. I love birds of all kinds. We have had a pair of cardinals nest in one of the trees in our back yarden for the past two years. Now, mama and baby come to our feeders daily. We keep them filled with black oil sunflower seeds which sow themselves in the ground beneath the feeders. The sunflowers are a happy bonus to feeding the birds. M would be in heaven! she says sunflowers are *her* flower.